"Girl in the Curl." Sunn died of cancer in 1998. 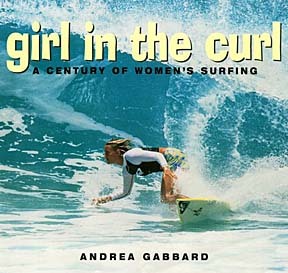 "Girl in the Curl: A Century of Women in Surfing"
AS LONG AS there has been a Polynesia, wahine have frolicked in the waves equal in ability and numbers with the kane. That is, until the dark ages in Hawaii, when the ancient old gods were abandoned and the missionaries of the new God discouraged activities such as hula and surfing. Although wahine haven't quite regained the ancient Hawaiian egalitarian ideal in the waves, the current generation of female surfers is claiming their space in the waves. And lest they forget, "Girl in the Curl" reminds them how far they have come, and how difficult it was to get there. At the start of the 21st century, females around the planet are again responding to the siren call of the ocean, and while their numbers don't quite match those of male surfers, their daring and skill are frequently on par. As usual, the wahine from Hawaii have been leading the way to the waves, and "Girl in the Curl" gives them full credit for their exploits that inspired generations of wahine surfers. Makaha's sea goddess Rell Sunn is lauded for her exquisite surfing style, infectious aloha, graciousness and indomitable spirit, as are her predecessors Ethel Kukea, Keanuinui Rochlen and Anona Napoleon. Multiple world champions, fierce rivals and fearless big-wave riders Margo Oberg and Lynne Boyer also are presented as worthy of emulation by the current crew of wahine wave riders. Southern California writer Andrea Gabbard has resumed her teen-age romance with surfing after a three-decade estrangement while she explored California's mountains. In "Girl in the Curl," Gabbard profiles the pioneers of women's return to the waves as well as the aquanauts of surfing's future. Rather than wax poetic about her own enchantment with the waves, Gabbard lets these world champions and soul surfers tell of their lifelong stoke for the ocean. Without specifically stating it, they all reveal why the surfing lineup is a much more enjoyable place when graced by the presence of wahine. Throughout the 20th century, the lineup has been a testosterone zone, as men's superior upper-body strength and aggression has allowed them to overcome obstacles such as heavy surfboards, crowds and intimidating waves to dominate the ocean arena. But as the 21st century gathers momentum, more wahine young and old are reveling in the ocean's exhilarating embrace, and capturing a larger share of contest prize money, sponsorships, media attention and respect from their fellow wave riders. At the forefront of this feminine tsunami are Hawaii's wahine o ke kai, who have helped the sport reach unprecedented heights. Consider Kauai's Rochelle Ballard, whose surfing has taken tube riding to new depths among women and whose tireless work as a board member of the Association of Surfing Professionals has given wahine pros new prestige and marketing power. Youngsters Melanie Bartels, Sena Seramur and Kristin Quizon are amazing other surfers with their undaunted athleticism. Haleiwa's Megan Abubo is a serious contender to bring the women's world title back to Hawaii, while Kauai's Keala Kennelly is converting believers with the reckless abandon of her ferocious assault on intimidating waves on the world tour. As a sweet counterbalance, Kennelly's surfing buddy Koral McCarthy has inspired a legion of longboarders to ride waves of all sizes and difficulty with an effortless grace that male surfers can appreciate but never approximate. 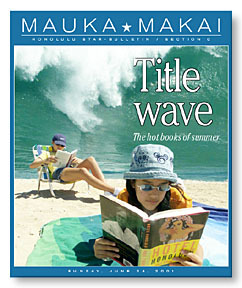 Somewhere, you just know that Rell Sunn is smiling as wahine take their rightful place in the ocean. Greg Ambrose is author of "Shark Bites: True Tales of Survival"